KAMPALA – The National Resistance Movement (NRM) has revealed that the top rebel members will not be allowed anywhere near the National Leadership Institute–Kyankwanzi for the upcoming caucus saying the group has become too rebellious to be allowed to take part in any party activities. The revelation was made today by Margaret Muhanga Spokeswoman, NRM Caucus while addressing journalists at Uganda Media Centre ahead of party caucus that is slated to run from 13th to 20th March 2019. Responding to question from journalists on whether the rebel MPs have been extended the invite, Muhanga admitted the six including Gaffa Mbwatekamwa (Kasambya County), Patrick Oshabe (Kassanda North), Barnabas Tinkasimiire (Buyaga West) Monicah Amoding (Kumi Woman), Nambeshe John Baptist (Manjiya County), Theodore Ssekikubo (Lwemiyaga County) are no longer considered NRM Members. Ms Muhanga argued that the party top organ has been analyzing the conduct of the members and their conduct was found wanting, so the top organ thought it fit to leave the rebel MPs out of the retreat because they wouldn’t be helpful and neither would they contribute anything but just join the caucus to oppose and bring mayhem during the meeting. “The MPs who haven’t been working with us and have been giving us hard time they come clad in red ballets yet they are NRM members like We don’t know about People Power, the People Power that we know is NRM has the power each village you go to, you find at least 30 NRM supporters. I don’t know of any party with more numbers than NRM,” added Muhanga. Questioned why the party has chosen to take the tough stand against those with dissenting views instead of reaching common ground, Muhanga said that the party did everything in its powers to redeem the souls of these members, but the rebels were found to be beyond redemption. “We went through the process and realized these people will never listen to us, we even hired counselor to counsel them, you know there are 28 NRM MPs who voted against the scrapping off of the Presidential Age limit, but they will be joining us for the retreat, but these ones have kept on fighting even after the session. You see each thing that the opposition calls for, they join, can you really say they are still in NRM?” Muhanga said. Asked further why the Party should continue deducting salaries of the rebel MPs if they feel they aren’t members of the NRM, Muhanga first referred the question to Parliament Accounts team, to which Solomon Silwany, Deputy Spokesperson NRM Caucus chimed in saying the rebel team can stop making contributions to the party since they aren’t under constitutional obligation to do so. 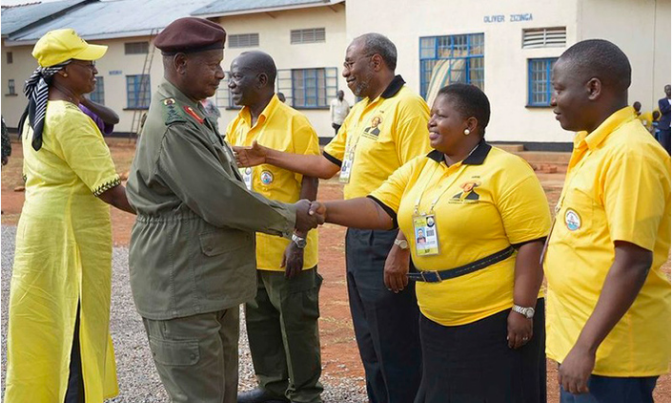 She also denied reports that endorsing President Yoweri Museveni as sole candidate ahead of the 2021 general elections will be part of the agenda whose theme will be industrialization for job creation and shared prosperity, where the members will also review the progress made under the second National Development Plan. “I have told you our agenda, the issue of saying we are going to endorse President Museveni isn’t part of the agenda. But if the Caucus members find out that there are some things we have forgotten in the agenda and introduce them in the caucus, we shall discuss them during the retreat and have a vote over the matter,” said Muhanga.